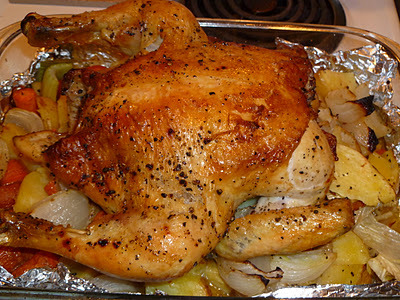 Roasted Chicken is a menu classic; but done correctly, it’s a Sunday-style meal that will continue to nourish all week. It’s all about making a bunch of vegetables and eating the chicken in small portions. You’ll feel satisfied from the protein, but full from the fiber packed nutritious vegetables, plus, it’s also a one-pot (or roasting pan) meal. Serve it up with a side salad or cooked grains and you’ll be reinventing a menu for the next few days. I like to organize my cooking by additionally roasting brussel sprouts or carrots at the same time. Then, I can use my already cooked food to redesign a meal: salad greens with chicken, brussel sprouts, walnuts and goat cheese with a balsamic vinaigrette or even wilted kale with mushrooms and the roasted vegetables from the chicken. All of a sudden you have options, you know what’s going in your mouth and it’s minutes away from customized perfection. 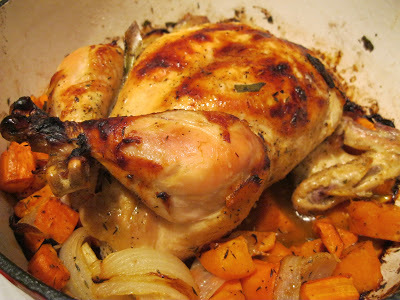 Regarding chicken: Try to buy organic, free range and humanly raised meat from a purveyor who knows their shuff. If you’re going to eat meat, it’s really important to put your money into the hands of the people who are supporting the world in local, thoughtful ways, from smaller farms. The flavor of the chicken is noticeably better, a hearty, earthy bird that actually tastes like chicken, instead of a chicken shaped animal that tastes like nothing, at best. Although it’s more expensive, you can amp up the vegetables to extend your dollar further. In a capitalist climate, the most important thing you can do as a participating member, is pay attention to where and how you spend your money. It’s like placing a vote for how you think animals should be treated, how purveyors should act, and how much should be produced. At the end of the day, it’s all about numbers and profit, love it or hate it. Spend thoughtfully because the numbers don’t lie. Preheat oven to 475*F. Line a 9″x11″ roasting pan with tin foil. Wash and chop vegetables into larger bite-sized pieces (think 1 1/2 inches). Put all the vegetable in the pan and season lightly with salt/pepper. I don’t add extra oil because cooking the chicken on a bed of veggies will produce moisture, fat and flavor. Minimize your raw chicken exposure by working on the paper or bag the chicken came in. If this doesn’t work, you can actually prep right in the vegetable pan, just be careful to keep your seasonings to the chicken and not over season the veggies. Pour the olive oil onto the chicken, massaging it into the flesh and under the skin as best you can; then season liberally with salt and pepper. Place breast side down on the vegetables. Cook for 40 minutes, untouched, with oven unopened. After 40 minutes, use tongs and carefully turn the chicken over, breast side up, cooking for an additional 20 minutes. 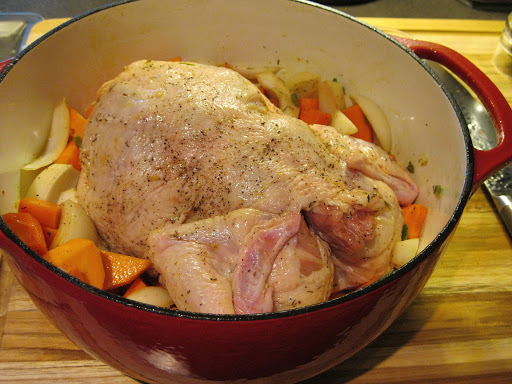 Depending on how big the bird is, you may need to add 10 minute increments to your cooking time. Temp the chicken in the thickest part of the breast, as the thermometer should read 165*F at finish. Cover with tin foil and let cool for 10 minutes before serving.